This sumptuous four bedroom oceanfront villa exudes luxury in every detail...the finest leather furnishings...custom wood cabinetry...stainless appliances...a dedicated workspace for those who can't leave work behind, high-speed wireless internet...CD player, radio & DVD with surround sound...all bedrooms have 32" LCD TV's with DVD...free local and long distance calling...it's a must see...a must experience! NOTE: 4-7 day stay requirement varies by time of year. No arrivals on Christmas day. Check in was quick and efficient. She also made some great recommendations for shopping and dining. Mary was very friendly and helpful. The rental process went smoothly. The lights didn't work in one of the bathrooms and they came out that day to fix it!! Quiet, clean & well maintained. Loved the pool. We enjoyed our condo as it was very spacious & well appointed. Barefeet Rentals was easy to work with and very helpful with local activities too. The state park and Capt Greg charters were great - both recommended by you. The condo was perfect - all could be together, but spacious enough that we weren't on top of each other and the view was great! Beautiful place!! The pool was incredible. Had a great time, would use again! The team was great and very helpful! Thank you. The property was very spacious! The gym was closed for repairs and the hot tubs did not have very strong jets. Otherwise the property was great! Mary was great. Thanks for all your help with our schedule requests! What a stellar villa on a great property. Spacious, beautiful views, my family was so blown away! Folks at the Mariners club gate were very helpful, friendly! very efficient and responsive to questions. the process worked as advertised. Spacious and open. Perfect for a large family. The only negative was that the ice maker wasn't connected. Very friendly & provided a good packet of local info. Great communication & ease of getting/returning keys. Oh! Beautiful view. Great place. Clean, modern. Great location. Loved spending time on the patio. We lacked nothing. One comment about the pool--- leaves should be removed at least twice daily. It looked like it was clean every morning but by early evening, palm debris in the pool again. Working with Barefeet Rentals (Mary) was seamless and very easy. Mary was always quick to respond with any questions or suggestions. Absolute paradise! 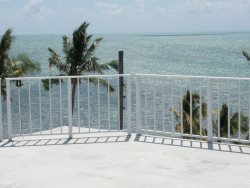 What is there not to like about a huge 4BR/3BA condo that opens to ocean views?? Well maintained and updated. Theater of the Seas was terrific. :) diving with Rainbiw Reef was great too. The property was well-laid out and each of us had space to spread out and relax with multiple tv's and wifi access. The multiple pools and exercise facility was also a nice amenity. Enjoy the great food and views for sunset each day! Great help in picking out the best property for my family.